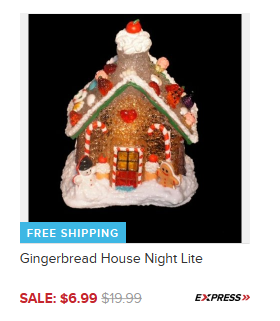 Gingerbread House Night Lite Only $6.99 + FREE Shipping (Reg. $20)! You are here: Home / Great Deals / Gingerbread House Night Lite Only $6.99 + FREE Shipping (Reg. $20)! Looking for inexpensive Christmas decorations? Then be sure to snag this super cute Gingerbread House Night Lite for Only $6.99 + FREE Shipping (Reg. $20) right now! You could buy a few of these at this low price and literally “deck the halls” with these – and the kids are sure to love them, too!